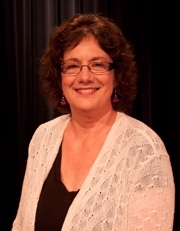 Prior to CCM, Regina Truhart served as Assistant Professor at the University of Florida (2003-2006), Adjunct Associate Professor at the University of Wisconsin at Milwaukee (2000-2001), and Lecturer at Northern Kentucky University (1999-2000). Her costume credits include Washington National Opera, Seaside Musical Theater (Daytona Beach, FL), Utah Shakespearean Festival and Opera Theatre and Music Festival of Lucca (1997-1998). Cincinnati credits include Ensemble Theatre of Cincinnati, Cincinnati Playhouse in the Park, Cincinnati Shakespeare Festival, UC-CCM, Cincinnati Ballet and Cincinnati Opera Outreach. Truhart has also been the recipient of the United States Institute of Technical Theater Award of Distinction and won first place in the National Opera Association video competition. BM and BA, California State University, Sacramento. MFA, University of Cincinnati, College-Conservatory of Music.